Fitting it is that Utah State is the NCAA Tournament flag-bearer for the state of Utah. The school should raise and wave a banner of resiliency, of pluckiness, of winning. Bouncing off a season a year ago — 17-17 and 8-10 in the Mountain West — that was anything but satisfying, the Aggies have bounced back with all the force of a Super Ball hurled by Craig Smith into the team shower stall. That ball bounces, still — straight into first-round play of the Midwest region of the NCAAs as an eight seed, beginning with a Friday game against ninth-seeded Washington, and a possible second-round match with North Carolina. What Utah State has done on the hardwood — 28-6, MWC champs — following what it did on the football field — 11-2, another grand achievement — makes USU the college success story of the year around here. 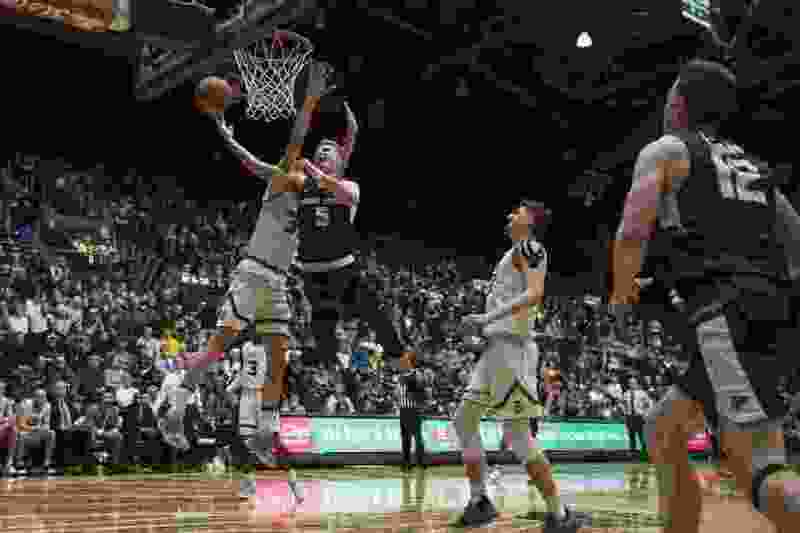 In those two big sports combined, gloriously wrapped together, the Ags are the state’s double-barreled shot of satisfaction, ricocheting past both Utah and BYU. Doesn’t matter what conference they play in or don’t play in, USU is Utah’s champion. And that was … unexpected. And pretty cool. The roundball part was launched when Smith took the wheel in Logan, charisma and positivity spilling in all directions. He actually convinced his players that they were good enough, talented enough to beat all the other teams in their league. It didn’t matter that when the Aggies took the floor pregame with those opposing teams, lining up for layups, an objective observer would think USU was about to get crushed. Other teams looked more athletic, more skilled, more everything, and then … they’d exit the floor afterward defeated. Utah State simply, and sometimes not so simply, found ways to win, all kinds of varying ways. They were down to Boise State, down to Colorado State, down to New Mexico, and it did not matter. Different guys stepped up to make key plays — Sam Merrill, Abel Porter, Quinn Taylor, whoever. There was almost a sense of destiny with this team. When trouble arrived, a loose ball went their way, an effort play, a 50-50 ball, whatever. Things fell into place, or were grabbed in traffic and firmly put into place. Merrill was and is the smartest player on the court — on his team, on any team, and often the best. Think of him as Einstein in shorts. He absorbed Smith’s playbook, utilizing a brilliant basketball mind. And then threw his body around like it was on the end of a mop, hitting the floor 10 times a game. Teams, like San Diego State in the MWC championship game, tried to beat the stuffing out of him. And he absorbed the force, firing on through, hitting shots, making plays. And so now, he will. Neemias Queta is a poor man’s Rudy Gobert, but a comparison with the Jazz big is compliment enough. The 6-foot-11 Queta protects the rim, using his 7-foot-5 wingspan to block shots and redirect opposing athletic wings, who otherwise would have had their way to the basket. He blocked nearly three shots a game during the Mountain West tournament, at times altering opponents’ entire game plans. There are others. Porter took over effectively at point guard during the season. Justin Bean is a hustle guy, in the tradition of Kurt Rambis, diving to preserve possessions, spreading energy where needed. Many Aggies contributed in significant ways. Now, they will take the floor Friday against Washington in Columbus, and, as the teams form their layup lines, the Aggies will probably look like they’re going to get slaughtered. Same if they face Carolina. When and if that happens, the Huskies and Tar Heels had best be worried and prepared. That’s the way it’s been all through a memorable Utah State season.